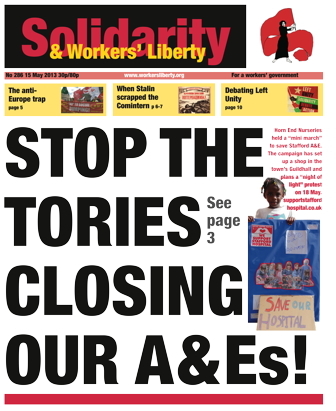 Stop the Tories closing our A&E's! Let us eat, drink and be merry! Tories push kids into poverty; Labour says "give up"
Badrul Alam from the Communist Party of Bangladesh (Marxist-Leninist) spoke to Solidarity. We’ve read about big demonstrations organised by Islamists demanding stronger religious laws. What effect are they having on the garment workers’ movement? Accident and Emergency departments are at crisis point. One in 10 patients admitted to A&E now have to wait more than four hours to be treated or discharged — double the figure this time last year. Workers across London Underground in the RMT union could strike in a series of disputes over a variety of issues. On 7 May, Unsion representatives on the National Joint Council (NJC, which negotiates local government pay) voted by 14-13 not to recommend rejection of the latest pay offer of 1%. The Public and Commercial Services union (PCS) meets in Brighton from 21 to 23 May for its annual conference. This year’s Ideas for Freedom — the annual weekend of socialist discussion and debate hosted by Workers’ Liberty — will focus on how Marxist ideas can help turn the tide of class struggle. For five years the ruling class, in Britain and all over the world, has been using the crisis of their system to their advantage — to ride roughshod over our living standards, our rights, and our resistance. Capitalism is widely discredited, but the tide of struggle is running strongly in the capitalists’ favour. We’ll be discussing how to change that. Steve Biggs, a dock worker and Unite rep at Southampton Container Terminal, spoke to Solidarity about his job. Yevgeni Preobrazhensky (1886-1937), was a Bolshevik, economist, and one-time member of the Trotskyist Left Opposition against Stalin. From 1904, Preobrazhensky sided with the Bolshevik faction in the Russian Social Democratic Labour Party, becoming a member of its Ural provincial bureau of the Party. During 1917, he was a delegate of the Chita Soviet in south-east Russia, and became a candidate member of the Central Committee of the Russian Communist Party.